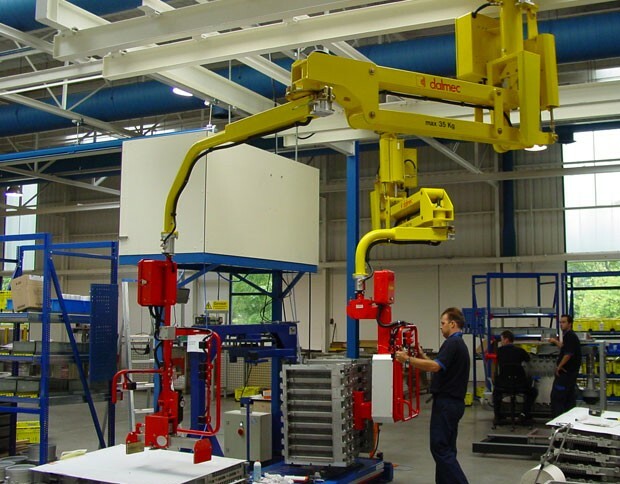 PMC type Partner manipulator, low profile column unit for operating in an area with low ceiling height. 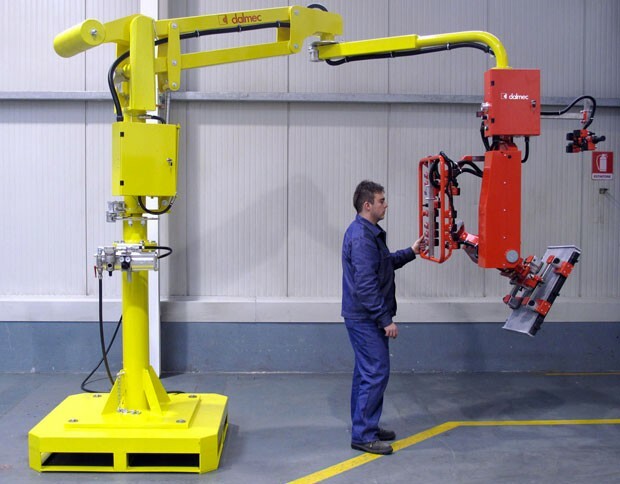 The unit is equipped with pneumatic grippers for handling electrical collectors, and enables the operator to handle them in a off-set position. Pneumatic tooling for gripping and 90° pneumatic inclination of washing machines. 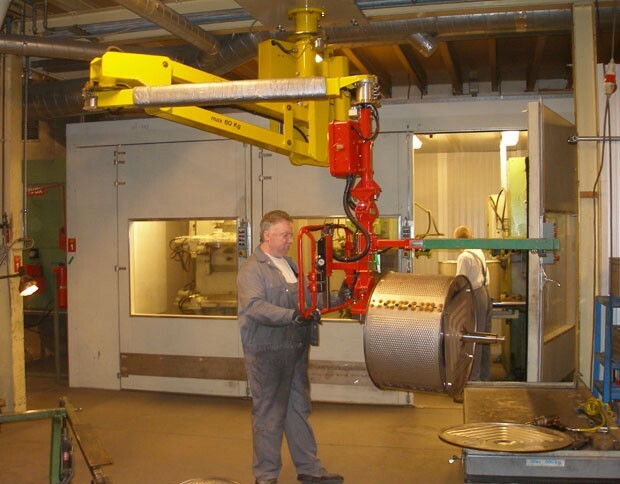 Manipulator equipped with a pneumatic gripper tooling for picking and tipping casting dies. 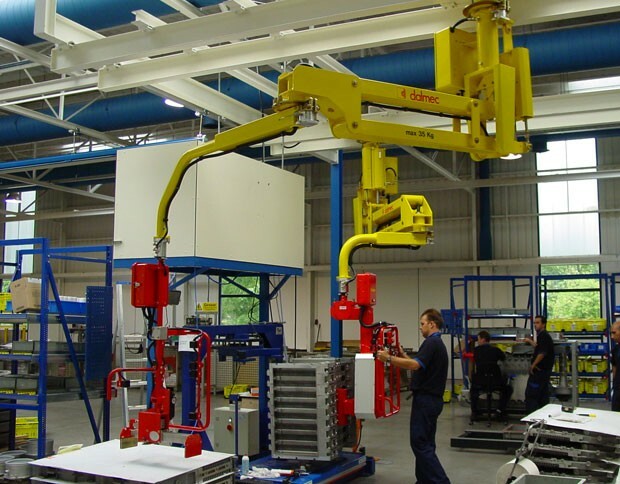 PMS type Partner manipulator, overhead trolley mounted, complete with pneumatic gripper tooling for the movement of boiler components, suitable for picking and moving components from an overhead conveyor, and following 90° pneumatic inclination, for placing these on a pallet. The overhead tracking is also made by Dalmec. 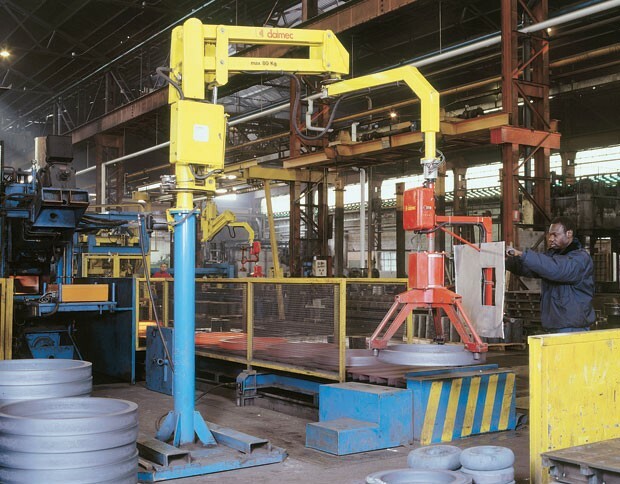 PMC type Partner manipulator, column mounted, used to handle cylinder heads. 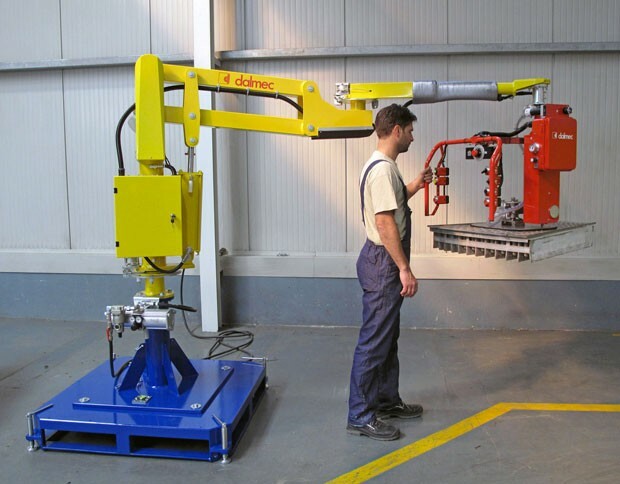 PMC type Partner, column mounted manipulator, equipped with magnets tooling for gripping mechanical components. 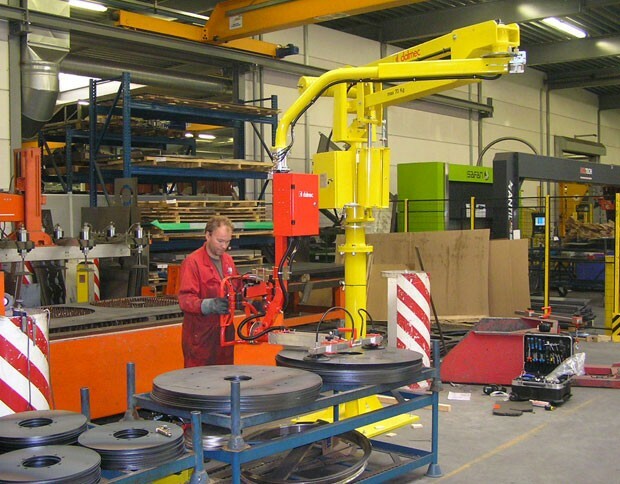 PMC type Partner manipulator, column design, with pneumatic gripper equipment, made to move mechanical parts from pallets to a vertical machine tool. 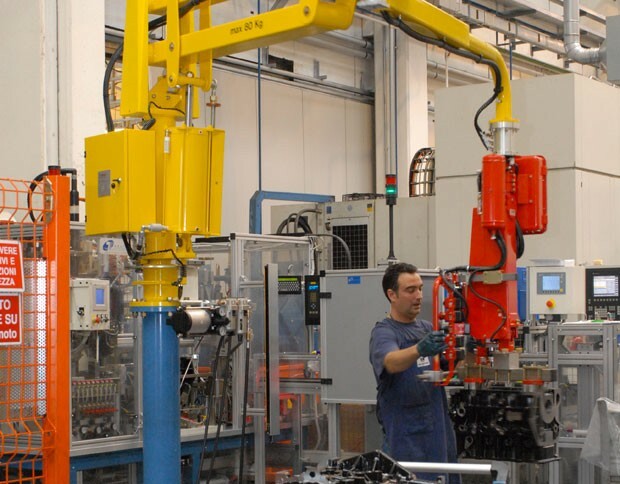 PMF type Partner manipulator, fixed overhead, provided with pneumatic tooling for gripping mechanical parts. 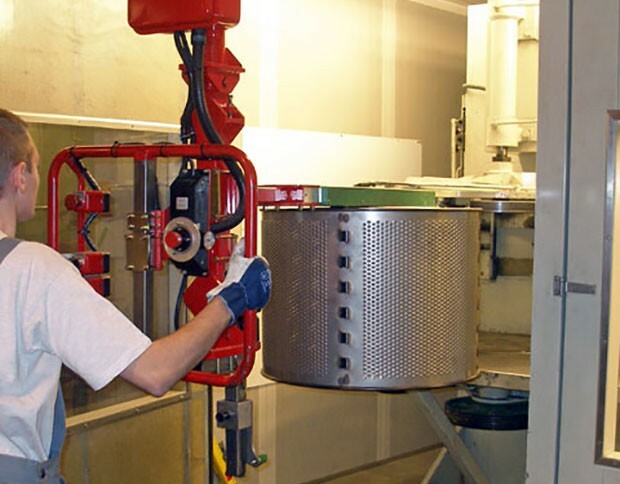 Dalmec can design the PARTNER EQUO with special tools fit to handle mechanical products of varying weights and dimensions, including: transmission shafts, leaf springs, gears, metal sheets, tanks, rolls, and more.